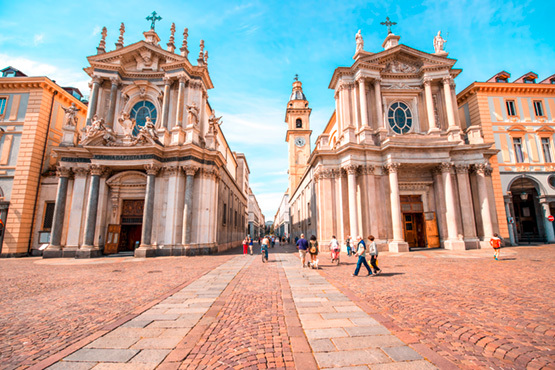 Experience Rome, Florence, Venice, Milan and the royal city of Turin. Experience the city highlights of Italy for 10 days. Your journey begins in Rome with over 2000 years of history and attractions such as the Vatican, the Colosseum or the Roman Forum. In Florence, unimaginable art treasures await you, before moving on to the lagoon city of Venice, the dream destination of all lovers and romantics. Milan is world famous as a fashion Mecca and shopping paradise. You can also shop wonderful under the arcades in the former royal city of Turin. Arrive in Rome by flight. Transfer to your hotel. Why not take a city tour in the afternoon to get an overview of this fascinating city? Rome is not only the capital of the state, but also home to the Vatican City in the middle of the city. This is where the spiritual leader of the Catholic Church, the Pope, lives and works. Speaking of God: You love ice cream? In the Gelateria Giolitti over 100 different varieties of ice cream await you – simply divine. Overnight in Rome. Overnight in Rome. Train ride to Venice – «the city for lovers». Romantic streets, hidden squares, small islands and idyllic canals give this city a unique atmosphere. Overnight in Venice. Today we recommend a trip by train to the nearby Lake Garda or Lake Como. See for yourself why stars like George Clooney have a residence here. The landscape is simply enchanting! Overnight in Milan. Train ride to Turin. Visit the Palazzo Reale or the Duomo and enjoy shopping under the arcades. Italy has always been synonymous with good food! Turin is dedicated to chocolate and is the birthplace of the praline. During a walk in the city center you will find numerous small shops offering their homemade chocolates. Overnight in Turin. Turin is the perfect starting point for a trip to nearby Piedmont with its beautiful vineyards. Treat yourself to a piece of real Italy! Overnight in Turin. Train ride to Rome and transfer to the airport in Rome.